*Rant Warning* This post contains statements with moderate to severe levels of sarcasm and rage. 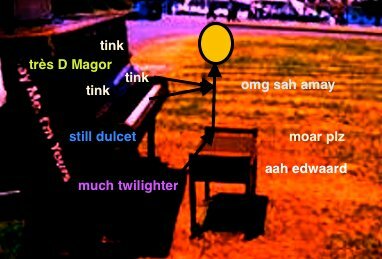 In 2008, I encountered my first street piano. 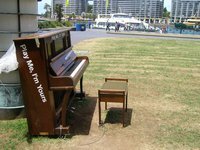 Coincidentally, this was the very year that street pianos became a thing officially – an international project by Luke Jerram. Briefly, he (or possibly his minions) acquire old 2nd-hand uprights and place them on the street, where people may play them at will. Anyway, it was in Sydney that this encounter occurred (I was not living here at the time) on a wander around Circular Quay (pronounced “Circular Qway”); I heard the faint, honky-tonk strains of a piano coming from near the contemporary art gallery. Someone was playing something … I don’t remember exactly what, but I was amazed by the concept. Whenever I’ve encountered pianos in the wild, they either normally come with ‘Don’t play’ signs, are locked, and/or everyone seems to be ignoring them like that old room-full-of-monkeys-cold-water-and-a-banana paradigm. Google the latter if need be. But this was different. It said ‘Play Me, I’m Yours.’ I do remember playing some Brahms Horn Trio on it, going off to see the gallery and later coming back to play some more. Encouraging public performance. Unthinkable! Liberating! 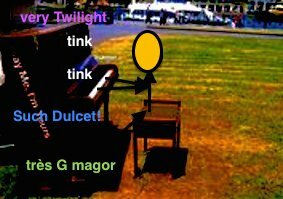 I spent over a week wandering randomly and locating ever more pianos scattered around Sydney, playing little more than a perfect cadence on each to establish its playability before going off in search of more. I even took a photo! But there was a dark side. Little did I realise that this seemingly wonderful project would soon inflict a rather unique form of dysfunction upon society. I can’t really think up a suitable name for it (I later did, piano hog-ism), so I will describe it. The street piano ideal is supposed to encourage lots of things; the curious with no musical experience tinkering for fun, children playing things they’ve just learnt, even professionals doing publicity stunts, all the while making music and expression happen in everyday public life. Wonderbar [sic]. What it doesn’t take into account is that often lots of people would like to have a go at a given piano as they pass it by. So they gather around the current performer, adding to the crowd of spectators. Mr Current Performer is playing something that requires two chords of arpeggios and would probably come from Twilight were it not completely improvised. The’ve not had formal training, but watched some Youtube videos of how to recreate favourite hits on piano with only two fingers and a truckload of looking like an affected, romantic musician. They reassure themselves they are being suave. After doing this for 10 minutes or so they decide to finish and look up. What an amassed crowd! And crowds, habitually at the very least, are biologically programmed to applaud at the end of performances. So they do. Encouraged and emboldened, the current performer decides to give them more of what they want, choses two new chords and launches off again. Some now bored spectators depart, only to be replaced by new ones, drawn by the crowd size, and with a fresh sense of wonderment. Those who still wish to play linger on. The pianist concludes after an eternity. The applause is still fresh and enthusiastic! Well I never! This goes on for some time. 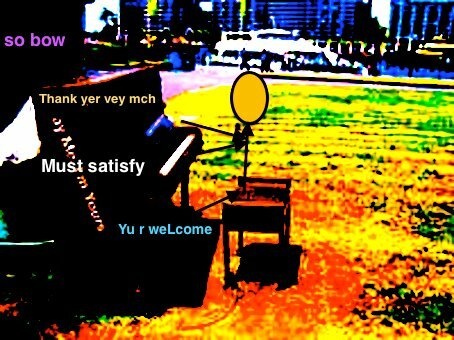 After a while, the pianist notices you. You’ve been there for either 40 consecutive minutes and 3 waves of renewable clapping, or even after much longer time intervals as you return to see if they’ve finished. ‘What could it be that you’re after?’ they ask themselves. The realisation dawns on them. ‘More of my wonderful playing of course!’ Mistaking the daggers in your eyes for captive stares and touched that they have such a dedicated fan, they continue this process unrelentingly until such time that a total absence of audience coincides with that brief, hopeful surfacing for recognition. B) Belief that a crowd must therefore only be present as spellbound moths to the flame, and the performer has a duty to keep going as long as there is an audience (unaware that people come and go). C) Applause, which means ‘Encore!’ Thus the performer believes they are creating something magical, which leads us back to A). There are many varieties of the piano hog (there I named it!). Sometimes they hunt in pairs or packs (as those in my last post), clunking and singing away at Beatles hits before swapping roles, creating the illusion of giving others a turn, when really just keeping it ‘in the family’ as it were, and providing a perpetual, mutually admiring audience of one at all times. An unhealthy, symbiotic relationship. Sometimes the piano hog is territorial. It is the guy who spends multiple hours on the same piano everyday on his way home from work, repeating the same few pieces. It is his ritual. This species builds up a library of all the passer-by compliments they received over time to cement their position of absolute dominance and validate their authority over the piano and interprets prospective performers as upstart rivals. Anyone who happened to be playing upon his arrival is met with a terse ‘I’ll take it from here, thank-you-very-much.’ Meanwhile, somewhere out in Hampstead, a marriage deteriorates as a partner dines alone. Again. Occasionally, the rarer breeds emerge. For instance, and for want of a better name, the I-actually-have-playing-piano-anonymously-as-my-career-path-but-i’m-not-getting-paid-osaurus. Often advanced in age, the above specimen is often seen dressed up especially in patched tuxedo or pinstripe suit, playing ragtime and putting on a show, like an amusement park character on a three-hour shift to accompany silent movies. However, this is not an amusement park, but Kings Cross, St Pancras. A relic from a bygone era (not even their own bygone era; silent movies had all but died out by the 1940’s), they rely on pity to a great extent, having gotten all prepped to come in and play they truly look as though they belong there. Asking them to move on would be like telling the sad, loyal old man who continued to make wooden barrels* unpaid on the doorstep of your father’s barrel factory in the decades after it closed down that the demolition team had already commenced countdown, and that the new Krispy-Kreme store that will replace the soon-to-be crater of his former, husk-like life has a strict no-barrel-maker hiring policy, and besides, he’s much too old. As you do. My left-handed attempt at the Krispy Kreme logo via a remarkably unresponsive online drawing program. So in conclusion, I must emphasise my gripes with the piano hog are not with his or her technical proficiencies or chosen repertoire. Indeed the most healthy aspect of the street piano is its encouragement of everyone. Instead, it is that most often those with marginal (as opposed to none)-to-moderate pianistic ability, sometimes have a strong tendency to lose awareness in regards to over-staying their welcome, becoming quickly addicted to positive public receptions. This quashes other peoples’ piano opportunities, not only other passing kenner und liebhaber pianists, but the curious and the to-be-inspired who perhaps had never had a chance to play a piano; the whole point of the project. To the piano hog I’d suggest that the swing-set etiquette analogy may perhaps serve as a useful guide: Have a good swing by all means! Enjoy peoples’ reaction to your impressive heights and death-defying leap off into the sand. But know when to stop, don’t ignore the queue and get right back on. Kthxbai. *A surprising amount of quandaries regarding things such as classical music’s meaning and role in today’s society can be resolved quite effectively if you replace ‘classical music’ with ‘barrel’ and solve for y. It is a total relief to be back where sunny days are considered normal, pedestrian crossings are much less harrowing/ambiguous to deal with, and if you want to get alcohol you get to go to a separate non-grocery store. I heartily apologise for the lack of updates – it has been more than a little hectic resettling back in Australia, and while there have been many stories accumulating as a result, they are unfortunately only self-interesting when placed in the context that most people experience them upheaving to a new (or old) place. As of now I am piano-less, ensemble-less and inspiration-less. I considered saying something about how I’ve been institutionalised by my time in the UK and I’d probably be swinging under a ‘Brooks was here’ etching in a couple of weeks, but it wouldn’t be true at all. 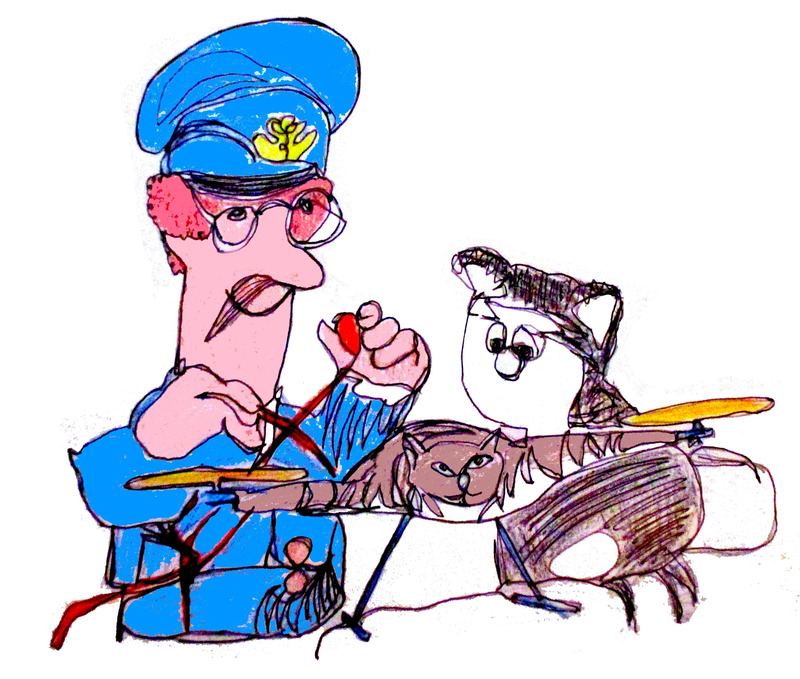 Perhaps fittingly, my last artistic endeavour in the UK was a Matisse-style single-line drawing of the stodgy Postman Pat photoshop job from a few posts ago. But as they say in gay Paris; Cat haute vitesse vaut attraper ver tôt! Nine more words bring the word count to 200.